With age comes a loss of skin elasticity and weakening muscles. Around your eyes, this results are puffy eyes or eyelids. Water may also collect resulting in dark areas around the eyes. The active ingredient in our Optimize Eye Cream - Acetyl Tetrapeptide-5 prevents eye-puffiness by inactivating Superoxide Dismutase, that is an inhibiting vascular permeability. 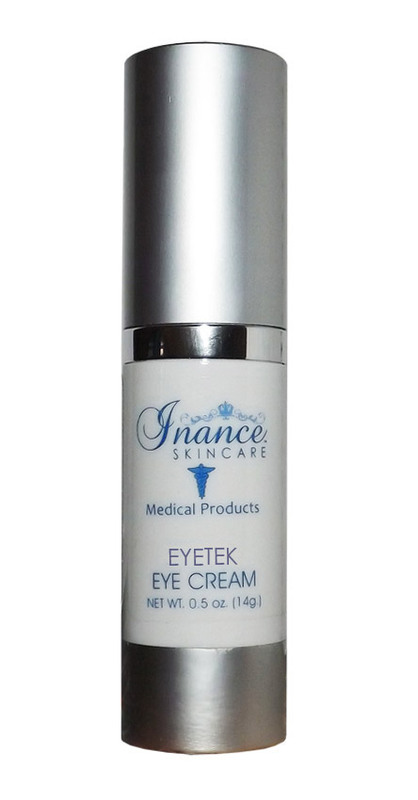 Reduces dark circles and baggy eyes using Acetyl Tetrapeptide-5, an ingredient shown to fight the causes of edema. In studies of our Inance Optimize Eye Cream, a group of 20 women aged 18-65 applied eye cream under the eyes, twice a day for 60 days. The participants showed reduction of puffy eyes in only 14 days and increased skin elasticity by 30% in 30 days. Participants also showed a noticeable decrease in dark circles and a 70 percent reduction in eye-puffiness after 28 days. Gorgonian Extract (Sea Whip), Yeast Extract, Squalane, Acetyl Tetrapeptide-5, Placental Enzymes, Bisabolol, Vitamin E, Deionized Water, Mineral Oil (Pharmaceutical grade), Decyl Oleate, Cetyl Alcohol, Glycerine, Glyceryl Stearate, PEG-40 Stearate, Caprylic/Capric Triglyceride, PEG-100 Stearate, Dimethicone, Phenoxyethanol, Methylparaben, Propylparaben, PEG 75M, Disodium EDTA.